Are you on the hunt for bath toys for toddlers? If so, we understand how overwhelming it can be due to how many choices are available. However, that’s why we’ve taken care of the hard part for you. We’ve researched and reviewed the top options to help you discover the one that you think is best for your child. A buying guide section is also available at the end which provides you with further guidance on how to narrow down your search. 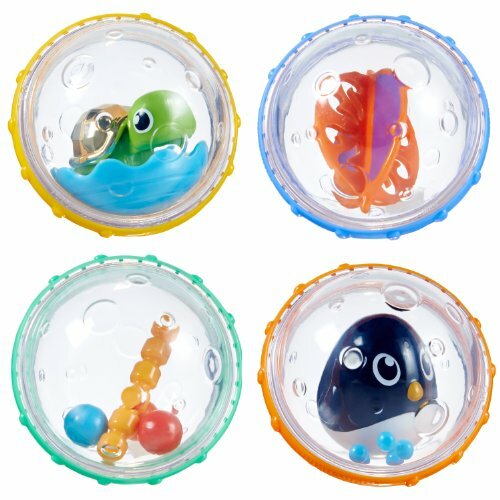 This bath toy set comes with a range of 3 bobbing characters that go underwater as well as a fishing rod that has a magnetic feature. This works to bring the underwater toys to the surface as they have magnetic inside which makes it easy for toddlers to fish with. We liked how the underwater toys have been designed with feature that prevents water from getting inside. This stops any mold from developing to keep them more durable. Parents have been liking how they’re easy to wash and dry too. While toddlers are trying to fish for the characters, their hand-eye coordination and motor skills are given the chance to develop well. 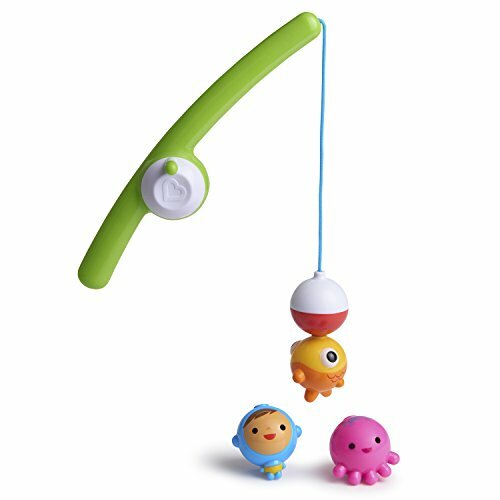 Toddlers have been loving how they can use this set to fish for the toys and have fun while developing their hand-eye coordination and motor skills. 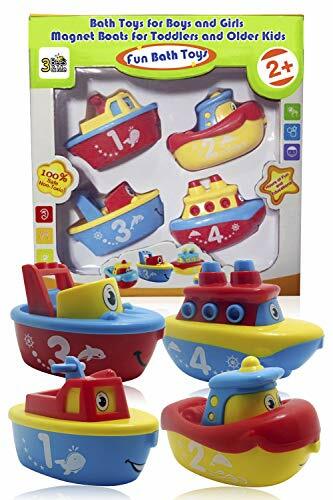 The 3 Bees & ME Magnetic Boat Set features 4 boat toys which provides toddlers with plenty to play with and be entertained during bath time. We liked how they’ve designed the boats with a range of different colors. This makes it more exciting for toddlers to play with. It’s also effective for improving their color recognition skills. In addition to this, they’ve used numbers on the boats which are awesome for helping toddlers learn how to count. Due to the boat design that has been used, toddlers feel encouraged to use them to play in more imaginative ways. Therefore, their creative thinking skills are given the chance to develop well. We liked how this set inspires toddlers to play with a lot of creativity, while also learning more about numbers and colors. Toddlers often find magnetic toys to be magical and they can be enjoyed for hours. 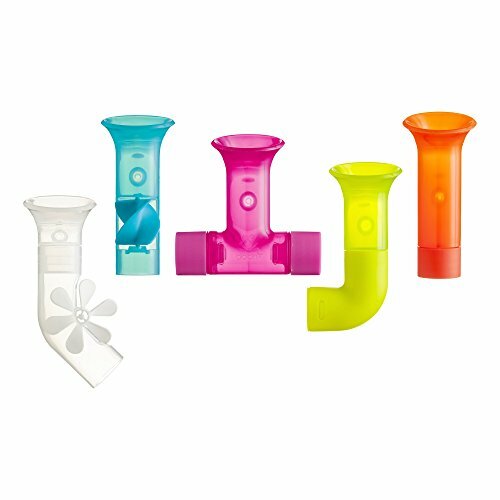 This Boon Building Bath Pipes Toy Set features 5 pipes that have each been designed with different features and shapes. As a result, kids are able to improve their shape recognition skills. The different functions that are available for each pipe are excellent for encouraging toddlers to think with more imagination due to how many possibilities are available. They can choose to use the pipes to pour water down through each other by connecting them, or use them individually. We were also impressed with how the pipes can be connected to the wall by using the suction feature. 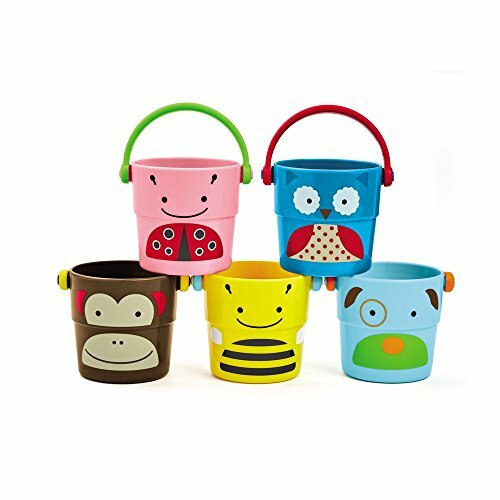 This is a bath set that involves a very hands-on approach, which is great for your toddler’s motor skills and hand-eye coordination. This is a unique set that allows toddlers to use their creative thinking to play with the pipes and connect them in different ways. Their coordination and motor skills are also able to develop well. 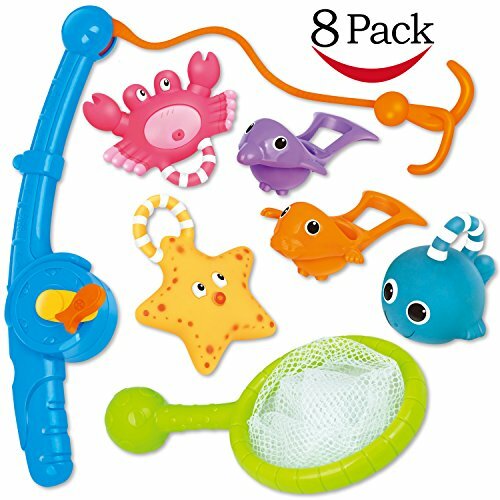 This Fishing Floating set comes with 3 squirting toys, 2 scoop toys, a fishing road, and a bag for organizing the various toys. Toddlers have a blast using the rod to catch the fish in the bath. It’s an exciting way to help them develop their motor skills and hand-eye coordination. Toddlers also have an absolute blast using the squirt toys. They include a crab, starfish, and puffer fish. Kids can squeeze them to fill them up with water and release them to watch how the water squirts out – it encourages them to play more creatively. Parents have been liking how the set comes with an organizer bag as it allows them to keep everything in one place. The bag also keeps the toys dry and prevents them from developing mold. The squirting feature enables kids to have a hands-on playing experience which is super fun and inspires them to play with more creativity. Not to mention, using the fishing rod is great for their motor skills and coordination too. 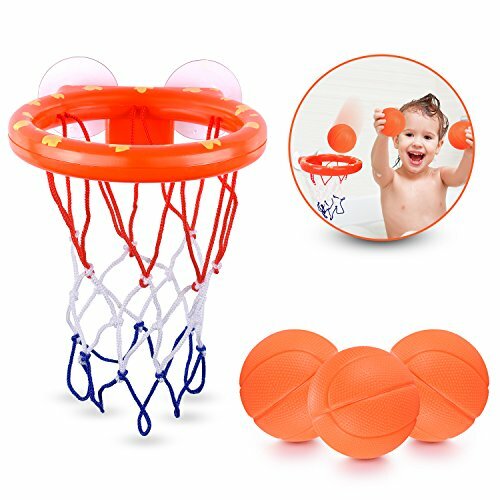 This Basketball Hoop & Balls Set will keep your toddler entertained during bath time to make your job a lot easier. It has an awesome SecureStay feature that lets you connect the hoop to a faucet which keeps it in place more than regular suction cups. The small basketballs, rim, and hoop don’t have any holes which prevents water from seeping inside and developing mold. All of the parts are easy to wash with a quick rinse under the water. 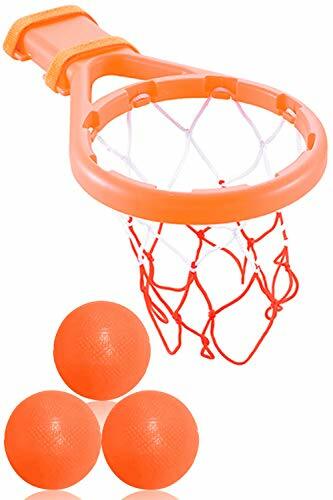 Toddlers have a lot of fun playing with this set by trying to throw the basketballs into the hoop. It’s a fun way to help them develop their motor skills and hand-eye coordination. The materials used to construct this set are also free from harmful components. The SecureStay feature is great for keeping the toy connected to the faucet which works better than suction cups. Toddlers are given the chance to develop their coordination and motor skills as well. 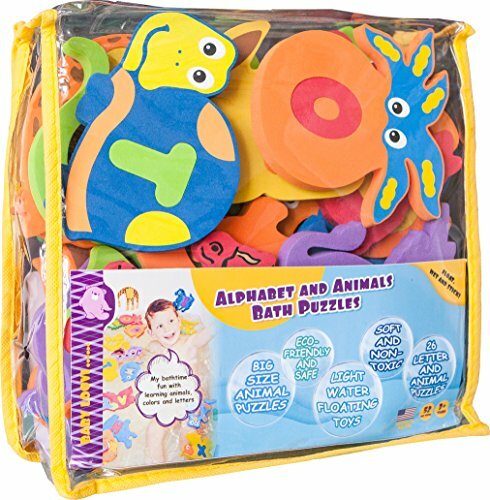 This Foam Bath Toys set comes with alphabet pieces which are large in size and light which makes it easy for toddlers to hold and play with. It’s a great set that helps toddlers to learn more about the alphabet and how to spell. Moreover, the pieces have been designed with various colors and animals. As a result, toddlers are able to improve their color recognition and knowledge of different animals. We were also impressed to find that there are little puzzles available which involves a hands-on approach. This feature is an effective way to boost your child’s motor skills and hand-eye coordination. It’s also awesome for improving their problem-solving abilities. This set is excellent for helping toddlers to learn about the alphabet while having fun with the puzzles and developing their coordination and motor skills. The Munchkin Float and Play Bubbles Bath Toy set features 2 character pieces that each come with a fun design. These are awesome for inspiring kids to use them to play in more imaginative ways, which is great for their creative thinking skills. They have also included 2 whirly toys that can spin around and make a rattle sound. These involve toddlers using them in a hands-on experience which is fun and develops their hand-eye coordination and motor skills. The rattling sound is excellent for stimulating your toddler’s audible learning skills too. Not to mention, there are textured parts to the toys which help toddlers to improve their dexterity. This set allows toddlers to play with a lot of imagination while also stimulating their listening senses, as well as their dexterity. 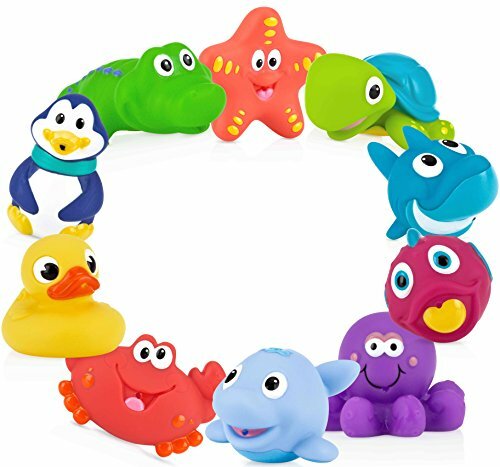 This Nuby Little Squirts Fun Bath Toys set comes with a total of 10 characters which provides toddlers with plenty to play with and be entertained during bath time. The characters include an alligator, fish, octopus, penguin, turtle, and more. The fun design encourages toddlers to play with them in more creative ways. Moreover, they have an exciting squirting feature available too. This lets toddlers squeeze the toy in the water and let go to watch how it squirts out water. This is a fun way to help your toddler develop their motor skills and hand-eye coordination. We liked how the toys have been created to be the perfect size for smaller hands as it makes it easier for toddlers to use. The bright colors also make it more exciting and can improve your child’s color recognition skills. We liked how they’ve made sure that these toys are the perfect size for smaller hands as it makes it easier for them to develop their hand-eye coordination and motor skills. 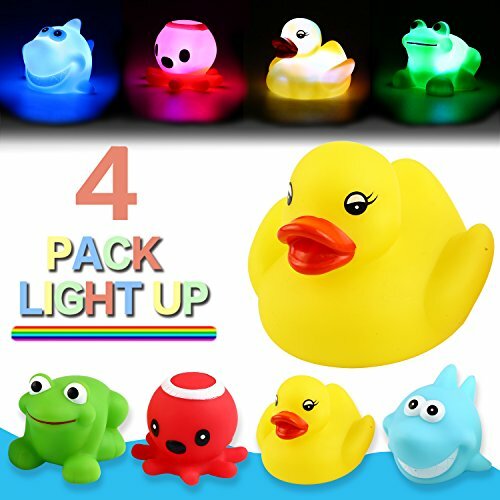 This Light Up Floating Rubber Bath Toys Set is an awesome way to make bath time more exciting for your little one. 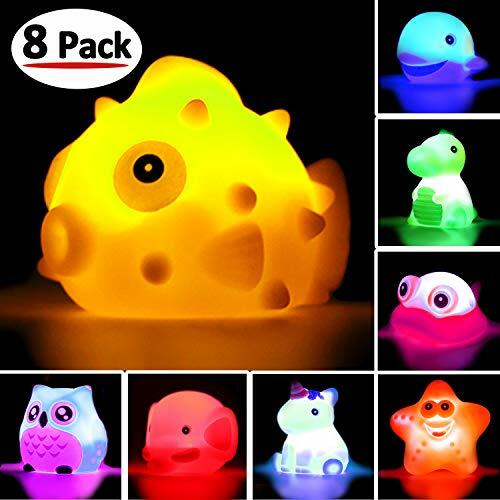 The toys automatically light up as soon as you place them into the water and they shine brightly which stimulates your child’s visual learning skills. There is a total of 8 different toys that have been created with an animal design. These are awesome for helping toddlers to learn how to recognize different animals. They have also ensures to design the toys to be a good size for smaller hands to handle. As a result, your child is able to develop their motor skills and hand-eye coordination. Parents have also been liking how the battery life of each toy lasts for more than 3 months. This set is an easy way to make bath time more fun due to the animal design and how each toy lights up. It’s great for your child’s visual learning skills and improves their knowledge on different animals. The size of the individual toys that are available in this set have been designed for smaller hands. Therefore, you can feel confident that your toddler will be able to hold onto them and play easily. This helps them to develop their hand-eye coordination and motor skills. We liked how the buckets that they’ve included have been created with bright colors. This makes them more exciting to play with and stimulates your child’s visual senses. Toddlers are also able to improve their color recognition skills too. Furthermore, children are able to easily stack the different parts, which is fun and inspires them to play with more imagination which boosts their creative thinking skills. Toddlers have a blast playing with this set and improving their color recognition skills, as well as their motor skills and coordination. 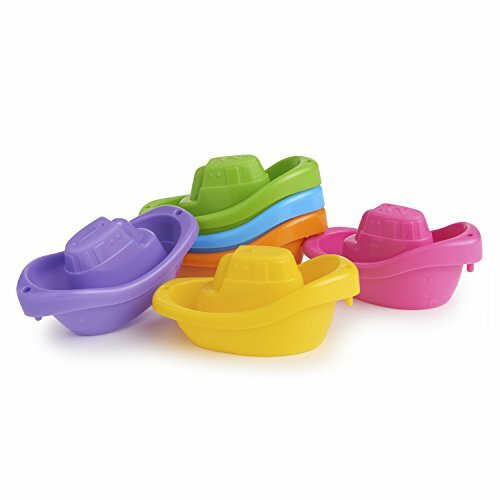 The Munchkin Bath Toy comes with a total of 6 boat toys which all float and can be connected together. This provides toddlers with plenty to play with and helps them to develop their hand-eye coordination and motor skills. They also have a lot of fun connecting the boats and being able to play with a lot of imagination, which is awesome for their creative thinking skills. In addition to this, some of the boats have numbers on them too. This is an excellent way to help toddlers to improve their counting skills and identification abilities. The toys that have been included have been created with a lightweight design which makes them easier for toddlers to play with. This bath toy set is fun for toddlers to play with and improves their counting skills, as well as their ability to play with creativity. 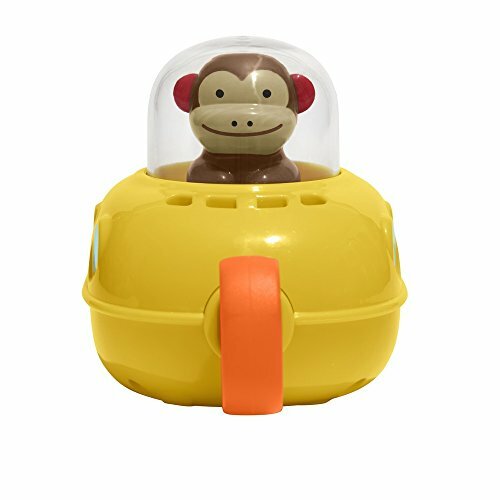 This Skip Hop Zoo Bath Pull and Go Submarine set has an animal design which makes it a lot of fun for toddlers to play with. It also improves their animal recognition abilities. 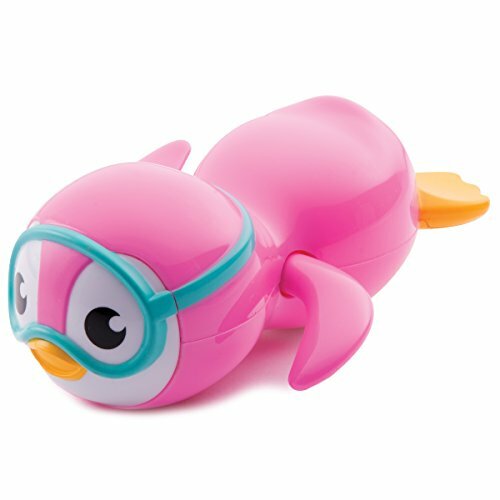 We liked how it comes with a pull string feature as it makes the propeller turn to move the toy underwater. Kids have a lot of fun playing with this set and it’s awesome for developing their hand-eye coordination and motor skills. All of the materials that have been used to create these toys have been made to be free from toxins, which keeps them safe for toddlers. Furthermore, the design of this toy help kids to play with more imagination. It’s also excellent for helping toddlers to improve their color recognition skills. Toddlers have a lot of fun playing with this toy as it involves a very hands-on approach which is great for your toddler’s motor skills and hand-eye coordination. Toddlers have been loving how this toy comes with a penguin design which makes it a lot of fun for them to play with. They’re able to use it to play with a lot of imagination too, which is great for their creative thinking skills. It has arms that can wind up and be released to make the penguin swim. It’s an awesome way to teach your child about cause and effect early on. This is super fun for toddlers and is effective at developing their hand-eye coordination and motor skills. In addition to this, we liked how they’ve made sure to make the toy lightweight and a good size for smaller hands. This makes it easier for toddlers to hold and play with. Kids have been loving how they can wind up the arms on this penguin toy and watch how it swims forwards. It’s great for their motor skills and coordination, as well as their creative play skills. 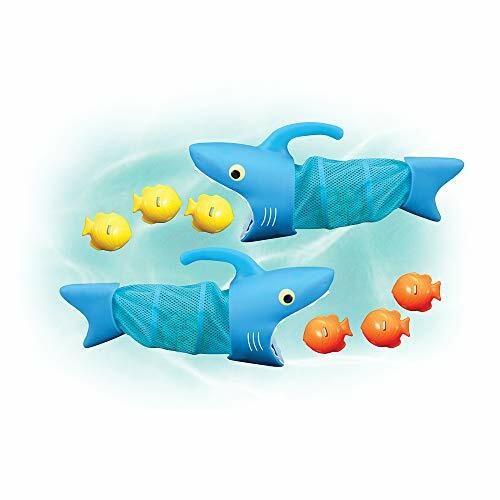 Melissa & Doug’s Sunny Patch Spark Shark Fish Hunt Game is an awesome choice for toddlers to play in the bath together. As a result, it can be an effective way to develop their social skills. The game includes nets and sinkers, as well as instructions on how to play. Therefore, it’s a very hands-on game that helps your child to develop their motor skills and hand-eye coordination. We liked how they’ve included some plastic handles as they’re easy for toddlers to hold onto and use. Moreover, the pieces have been constructed with high-quality plastic materials which means they’ll be durable for a while. Toddlers have been having a blast using this set to play in the bath and it can improve their social skills, as well as their motor skills and coordination. This Basketball Hoop & Balls Playset can be used inside the bath, as well as outside it for more playtime elsewhere. We like how it comes with high-quality suction cups that allow it to easily stick to flat surfaces. While trying to throw the balls into the hoop, your toddler is given the opportunity to develop their hand-eye coordination and motor skills. You could also create a counting game by having them keep score of how many points they score. This can be a fun and effective way to boost your child’s counting skills. Parents have also been liking how they can get involved with their little one and play together. It makes for some great bonding time. Toddlers have been having an absolute blast with this set during bath time and being able to develop their motor skills and hand-eye coordination. 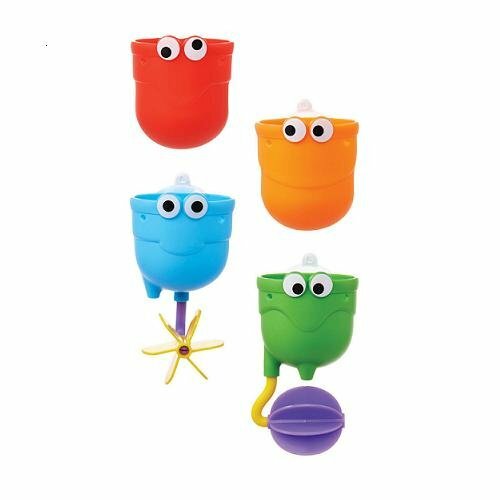 This Munchkin Falls Bath Toy features a cup that toddlers can use to scoop up water and pour it over the other toys. As a result, they’re encouraged to use the the set to play in more imaginative ways which is great for their creative thinking skills. Kids are also able to change up the position of the different cups and toys which helps them to develop their motor skills and hand-eye coordination. We liked how they’ve used bright colors to design each of the different toys available in this set too. It’s an excellent way to help toddlers improve their color recognition skills. This is an excellent set that helps toddlers to develop their hand-eye coordination and motor skills, while also being able to play with a lot of creativity. This Yeonha Bath Toy set comes with an awesome light-changing feature which is exciting for toddlers to play with. It also helps children to develop their color recognition skills. When you put the toys into the water, it turns the lights on – they then turn off when you take them out of the water. There is a range of 4 different toys available which provides toddlers with plenty to play with during bath time. The toys are also a great size for smaller hands, which makes it easier for toddlers to hold onto. As a result, their hand-eye coordination and motor skills are given the chance to develop well. The animal designs that have been used are also great for helping kids to learn more about different animals. The light up feature that’s available with this one makes it super exciting for kids to play with and stimulates their visual learning senses. Now that you have a better idea of what some of the best bath toys for toddlers have to offer, you can start to focus on the ones that you think would be best for your child. If you’re still not feeling 100% confident on which one to pick, don’t worry. We’ve put together this buying guide section to provide you with some great additional information. By the end, you’ll be feeling great about the toy that you want to get for your child, regardless of whether they’re 3 year olds or under. After reading through the toys in this review, you will have noticed that there are some different kinds available. If you were interested to learn more about these different kinds of toddler bath toys, check out the section below. Rubber ducks are a classic bath toy for a reason. They’re simple yet have a bright color and fun design that keeps kids engaged and able to play with a lot of creativity. The wind up toys that we’ve reviewed in this post are a lot of fun to play with in the bath. They allow kids to wind them up and let go to watch how they swim in the water. It’s a unique way of playing that helps toddlers to develop their hand-eye coordination and motor skills. Boats are an excellent kind of toy for bath time. This is because toddlers have a blast playing with it and pretending that it’s a boat in the sea. As a result, their ability to play with more imagination is improved. Musical bath toys can be fun for toddlers as they’re able to sing along and stay occupied while having a bath, which makes the job of parents a lot easier. Furthermore, your toddler’s audible learning senses are able to be stimulated. Toy nets are exciting for toddlers to use in the bath to try and catch fish toys. Their motor skills and hand-eye coordination are able to benefit greatly from these kinds of toys. Foam toys can make for awesome bath toys because you don’t have to worry about when water seeps in. You can simply leave them to dry and not be concerned with them developing mold. Car toys are similar to the boat ones because toddlers are able to use them to play in more imaginative ways. Therefore, their creative thinking skills are able to develop well. There are a number of animal toys that have been reviewed in this post because of how well toddlers respond to them. These bath toys enable them to learn more about different animals. Not to mention, they have a blast using these types of toys for pretend play scenarios, which is awesome for their creative thinking processes. Disney bath toys can be a great choice for 1 year olds and over who are fans of the movies. So, if you find any Disney-themed bath toys that feature characters that you know your child loves, they would be an awesome choice. When it comes to finding baby bath toys for boys, we recommend that you go with the sporty ones or the options that involve a very hands-on approach. For example, the 3 Bees and Me Basketball Hoop and Balls set would be an awesome choice. This one may be best for 2 year olds and over because they’ll be able to aim and shoot a little better. The Boon Building Bath Pipes Toy Set would also provide boys with a lot to do and figure out. Their motor skills and hand-eye coordination are able to develop well. As far as the top options for girls are concerned, the ones that include bright colors, especially pink and purple, would be great choices. This is because girls tend to respond better to these colors and feel more inspired to play with those kinds of toys. Moreover, their color recognition skills are given the chance to improve. So, that wraps up our guide to the top tub toys for toddlers. Hopefully, everything that you need to go ahead and select the right toy for your toddler can be found here. Be sure to read through the main features, pros, cons, and what makes each toy stand out. That’s what will provide you with the information that you need to make the best decision. The buying guide section also contains additional details that can prove useful too.